Litigation, Trials & Appeals | Craig, Terrill, Hale & Grantham, L.L.P. Our attorneys have established a national reputation based on the strength and depth of their litigation talent. We emphasize defense representations and we know and understand the businesses and business concerns of the clients we defend. Our litigation team includes Bob Craig and Grady Terrill who are AV rated attorneys and senior partners with extensive litigation experience. Our litigation team also includes Bud Grossman who is a Board Certified in Personal Injury Trial Law by the Texas Board of Legal Specialization. Gary Bellair is board certified in Civil Appellate Law by the Texas Board of Legal Specialization. Marcy Erwin is also a talented member of our team. Our experience enables us to represent a diverse clientèle, ranging from individuals to established companies throughout the state and across the country. Our appellate lawyers routinely handle civil appeals to Texas Supreme Court and Court of Appeals, and the United States Supreme Court. We are committed to the art of appellate advocacy. Our appellate team includes Gary M. Bellair, who is Board Certified in Civil Appellate Law by the Texas Board of Legal Specialization. Our active involvement includes membership in bar committees related to appellate practice and frequent publication of Newsletters addressing issues of interest in Texas law. Our attorneys have experience handling the specialized discovery problems and investigative issues that arise in aviation-related matters. Craig, Terrill, Hale, & Grantham, L.L.P. has represented manufacturers of aircraft and aircraft components as well as fixed based operators and pilots in product liability litigation stemming from aircraft accidents. We also have the expertise necessary to resolve insurance coverage disputes in aviation policies. We represent individual and business clients in all forums in our Business Litigation practice. Whether the controversy arises in the federal or state courts or in an administrative or alternative-dispute-resolution proceeding, we strive to advance our clients’ business goals and objectives while resolving the litigation in the most creative, cost-efficient and expedient manner available. We also provide guidance to our clients on methods of avoiding litigation and advice on using negotiation, mediation, and other non-litigation alternatives in order to resolve business and commercial disputes. Construction – The firm has significant experience in construction litigation over both commercial and residential construction defects as well as business related contractual disputes among contractors, owners and subcontractors. The firm also represents several general and subcontractors on an ongoing basis concerning the filing of mechanic’s and materialman’s liens in both residential and commercial construction matters to obtain construction funds for deserving contractors that remain unpaid. The firm has enjoyed success in obtaining principal amounts due as well as attorney’s fees for our contractor clients over the years through engaging in the active filing of liens, trapping of construction funds, claiming against construction trust funds and against performance and payment bonds on both private and government sponsored construction jobs. The firm also represents various commercial property owners on an ongoing basis regarding the contesting and removal of wrongfully filed or disputed mechanics’ and materialman’s liens. The firm is experienced in representing both plaintiffs and defendants, including consumers, businesses, creditors and financing institutions in cases involving allegations under the Texas Deceptive Trade Practices Consumer Protection Act, Finance Code, and other consumer related statutes. Consumer laws, in general, are intended to protect the average consumer from deceptive business practices, dangerous products, or other problems; but they also serve to protect merchants from liability or frivolous actions asserted against them by consumers. The firm is experienced in representing both plaintiffs and defendants, including individuals, businesses, creditors and financial institutions in civil lawsuits involving allegations under the Texas Deceptive Trade Practices Consumer Protection Act (DTPA), the Texas Finance Code, and other consumer related statutes. We represent financial institutions, wholesalers, manufacturers and retailers as creditor’s counsel. Our experienced includes application of rights to immediate seizure (foreclosure, detinue and replevin actions, receiverships) and adversary proceedings in bankruptcy courts. We use these rights to enforce contractual claims including mechanics liens, rights under security agreements, mortgages, and leases throughout the state. Our attorneys are experienced in handling substantial bankruptcies and routinely handle the protection of debtors and creditors on secured transactions in cases involving department stores, retail shopping malls, textile mills and single asset real estate matters. Commercial and consumer claims are pursued in all courts throughout Texas. We also defend creditors on matters involving bad faith, slander of credit, wrongful repossession, warranty actions, actions seeking recovery of equipment, and claims involving deficiencies and money due under contracts. We offer review and advice on complex lender relationships to determine workout documentation and risk assessment. We also represent financial institutions in lender liability cases involving interference with corporate governance, fraud, duress, misrepresentation, negligence and breach of good faith. We work closely with employers, especially small businesses, to address employment issues from start to finish, to assist our clients in customizing employee handbooks, and to define and draft policies and procedures. In addition, we are experienced with state workforce commission responses and appeals, state and federal agency investigations and mediations (EEOC, Texas Commission on Human Rights), state and federal employment litigation defense (including discrimination, sexual harassment, wrongful termination, civil rights claims, unfair wage and hour pay practices and workers’ compensation), and state and federal appeals of these issues. Combined with our Business Litigation experience, our attorneys strive to provide timely, needed, employment law advice and help to our business clients. The firm serves as counsel to several major commercial insurers to assist, counsel and advise them regarding coverage issues and opinions on various types of commercial general liability, professional liability, and errors and omissions insurance policies. The firm also advises, represents and defends insurers in first party claims when insureds allege bad faith and breaches of various duties by the insurer. Our attorneys understand the issues inherent in insurance litigation. 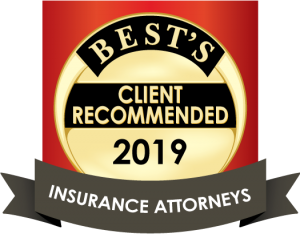 Our years of experience and defense-directed practice allow us to quickly and correctly analyze issues, risks and exposures for insurance based litigation. Insurance industry clients rely on our abilities to assess, anticipate and vigorously defend claims for damages. Whether in discovery, deposition or trial, we aggressively protect our clients’ interests by putting in the necessary preparation, asking hard questions, and revealing the weaknesses in our opponent’s position. We also assist insurance companies litigating questions of specific coverage responsibility under issued policies of insurance. We are experienced in defending physicians and other healthcare providers and practitioners against claims of medical malpractice. Claims of medical negligence are complicated and often emotion-filled. While doctors and other health-care providers must follow certain standards when caring for patients, a simple mistake is not enough to constitute negligence. Our attorneys understand the standard of care required to meet the thresholds for claims of medical negligence and they use a network of resources to aggressively defend clients facing claims arising from the practice of the health care profession. The firm has an extensive civil litigation practice defending serious oilfield and industrial injury claims and wrongful death actions, including claims involving heavy industrial equipment. Since its inception, the firm has successfully represented insurers, their insureds and companies in oilfield explosion cases, equipment failures and serious industrial injury claims in early mediations, at trial and on appeal. We have represented insurance companies, manufacturers, distributors, and retailers in cases pertaining to a broad array of products, including consumer goods, chemicals, power tools, manufacturing equipment, lawn mowers, ladders, cranes, scaffolds, bicycles, all terrain vehicles and handguns. We also have experience in defending mass tort and toxic exposure cases. Real Estate – Our firm maintains an active litigation practice in the traditional real estate arena concerning title disputes, including actions to quiet title and removal of clouds on title for commercial, rural and residential properties, as well as water diversion and water pollution matters in Lubbock and regional West Texas. The firm also advises various title companies and real estate agencies, individual agents and mortgage companies in Lubbock and the surrounding region. We assist clients in all aspects of Probate, Estate Administration, and Trust Administration. Our lawyers are experienced in matters involving disputes relating to the probate of wills, administration of estates, breaches of fiduciary duty, trust modification, and trust and will construction.